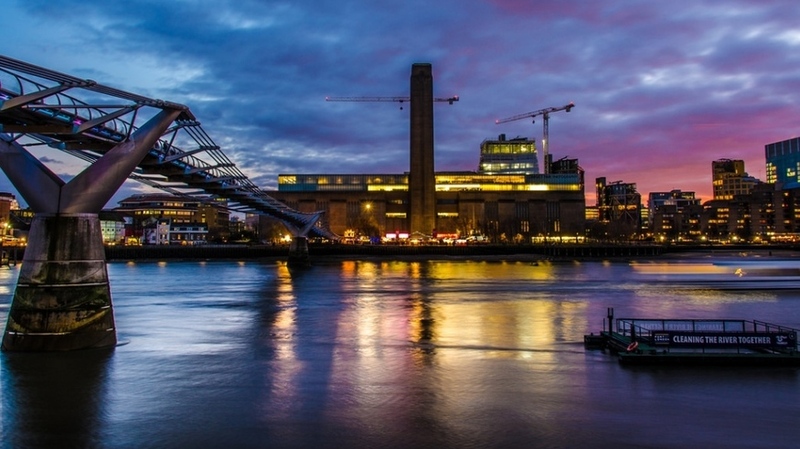 How much do you know about the Thames? Try our fiendish quiz below and see how you score. Answers at the bottom of the page. 1. Which band tethered a helium-filled pig to Battersea Power Station for their 1976 album Animals? (a) A 10-metre high Michael Jackson; (b) a giant goat with the voice of Nigel Farage; (c) pop duo Jedward being pursued by flying sharks; (d) a wooden hippo. 3. The first ever Thames Festival took place in 1997. What was the only major event, which attracted headline news? 4. The last frost fair — when the Thames froze over completely — took place in 1814. What animal was led across the Thames at Blackfriars to demonstrate the solidity of the ice? 5. In July 1815, a gentleman called Usher the Clown made his way along the Thames in a bath tub. What kind of animals did he use to pull along his unusual vehicle? 1. Which Thames Bridge gets the most mentions in the novels of Charles Dickens? 2. In Three Men in a Boat by Jerome K Jerome, three friends and a dog take a journey upriver to Oxford from which riverside town, now part of Greater London? 3. The Hogarth Press was established by Virginia and Leonard Woolf in 1917. In which riverside area were they living at the time? 4. Which famous Victorian novel begins on the River Thames, and served as inspiration for the film Apocalypse Now? 5. Near Shakespeare’s Globe can be found the remains of another Tudor theatre, whose foundations are still used for theatrical productions. What was, and is, its name? 1. In which Thames-side town would you find the Clattern Bridge, thought to be London’s oldest? 2. Richmond is the only London borough to straddle the Thames. Which King, who was also Earl of Richmond in North Yorkshire, built a palace here that gave its name to the wider area? 3. In which county is the official source of the Thames? 4. Which Thames-side town connects Noel Coward, the bounding bomb, and the Monty Python fish-slapping dance? 5. Which Thames-side area takes its name from a medieval farmstead noted for its cheeses? 1. Where on the river can you find John Burns, Ernest Bevin and James Newman? 2. Where, in Tudor times, would you have found the riverside Palace of Placentia? 3. Which two London boroughs are at either end of the Thames Barrier? 4. The Swanscombe Peninsula in Kent and West Thurrock in Essex hold the UK’s tallest examples of what? 5. A ferry operates between Gravesend and Tilbury for foot passengers. How much is a single adult fare? 1. Which Thames Bridge is sometimes called The Ladies Bridge, after the female workforce who largely built it? 2. On which bridge will you find a skateboard graveyard, where broken decks are discarded? 3. Which is the only train station with entrances on both sides of the Thames? 4. Which bridge is famous for its balustrades, which cast shadows that look like penises? 5. Which London Bridge features a miniature funicular railway? 1. Which of the following is not one of London’s floating pubs? 2. Which 1990s band opened their 1995 single History with the following lyrics, inspired by William Blake: "I wander lonely streets. Behind where the old Thames does flow"
3. Jeffrey Archer, Bernie Ecclestone and Bond-theme composer John Barry all, at different times, owned the same Thames-side penthouse — in which part of London? 4. Which is the only operational rail route to travel under the Thames that isn't on the standard tube map? 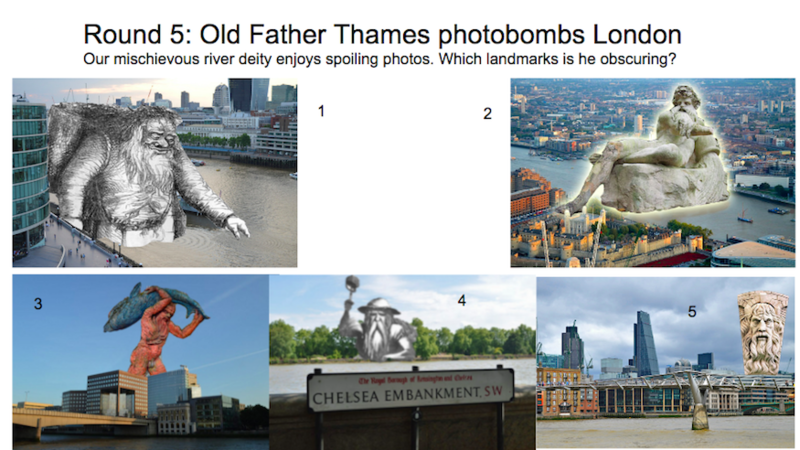 5. Who made the Thames disappear in 2009? 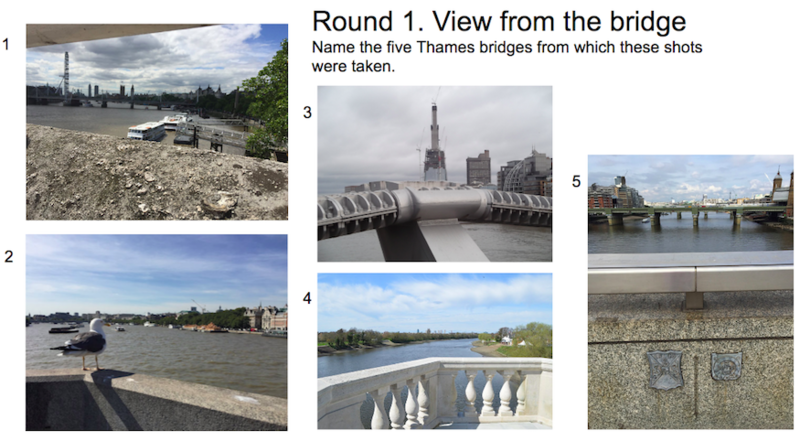 These questions were presented at the Totally Thames floating quiz 2016. The winning score on the night was 32.